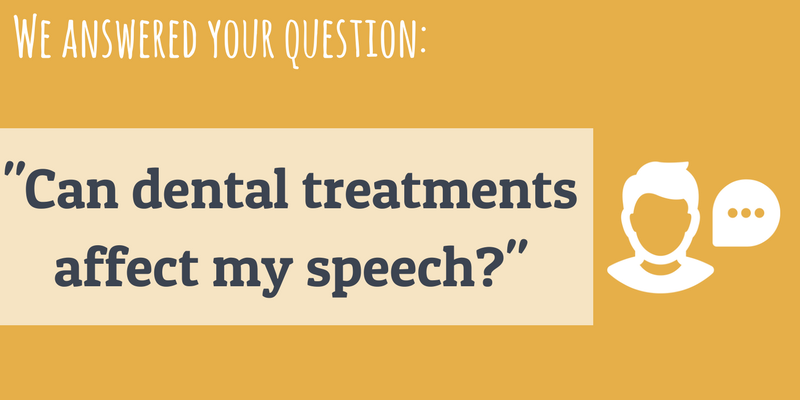 Can dental procedures affect my speech? It’s common to have pronunciation challenges right after having new crowns, bridges, veneers, dentures, or Invisalign trays fitted. The good news is, you can expect this to resolve quickly. Some dental patients complain of slight slurring, hissing, lisping, spitting and problems with the sounds “th” “f” and “s”. Usually, this is minor and slight and only audible to the person who has had the dental treatment, in severe cases, it can be audible to others too who are used to your normal way of speaking. The thicker the material, the longer it will take to adjust. Crowns and veneers are made of strong, thin porcelain in the shape of your natural teeth. This may take a few hours at most to get used to. Denture patients can expect it to be several weeks before the brain can rewire itself to the new way of speaking. One study of Invisalign patients found that in those cases where some type of speech impediment was noticed, the person typically adapted and their ability to talk returned to normal within a short period of time, usually no longer than a few days. Silly Sally swiftly shooed seven silly sheep. The seven silly sheep Silly Sally shooed. Shilly-shallied south. These sheep shouldn’t sleep in a shack; Sheep should sleep in a shed. The sixth sick sheik’s sixth sheep’s sick. (According to the Guinness Book of World records this is the hardest tongue twister by far! Which wristwatches are Swiss wristwatches. If a dog chews shoes, whose shoes does he choose. Four fine fresh fish for free.